That’s why we loaded ACANA GRASSLANDS with ranch-raised lamb, free-run duck, nest-laid eggs and wild-caught ﬁsh — all raised or ﬁshed within our region and delivered to our kitchens fresh so they’re loaded with goodness. Grain-and-potato-free to reduce unwanted carbohydrates, ACANA GRASSLANDS features fruits and vegetables delivered fresh and whole from our sun-drenched orchards and black prairie soils. Prepared from Canada’s best ingredients in our award-winning kitchens, ACANA GRASSLANDS keeps your cat or kitten healthy and strong. Read our ingredients and we think you’ll agree! 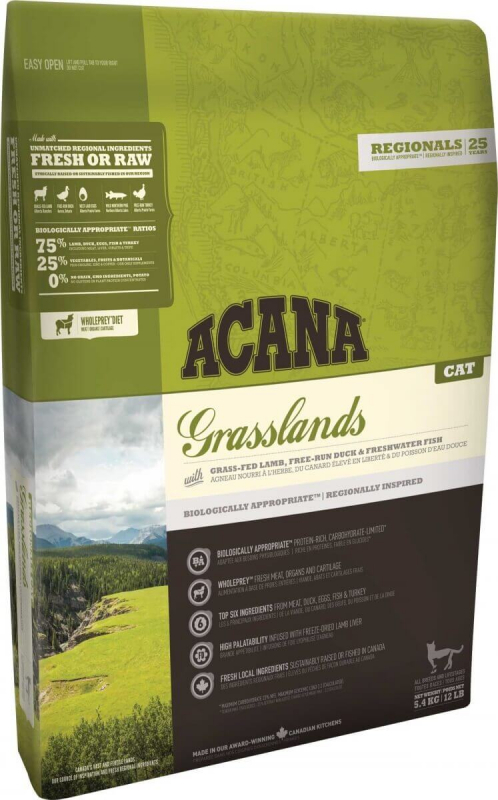 Loaded with 70% of meats and fish, ACANA Grasslands matches your cat’s evolutionary adaptation to a meat & protein rich diet, and its fresh meat variety mirrors the diversity and freshness of the natural diet. 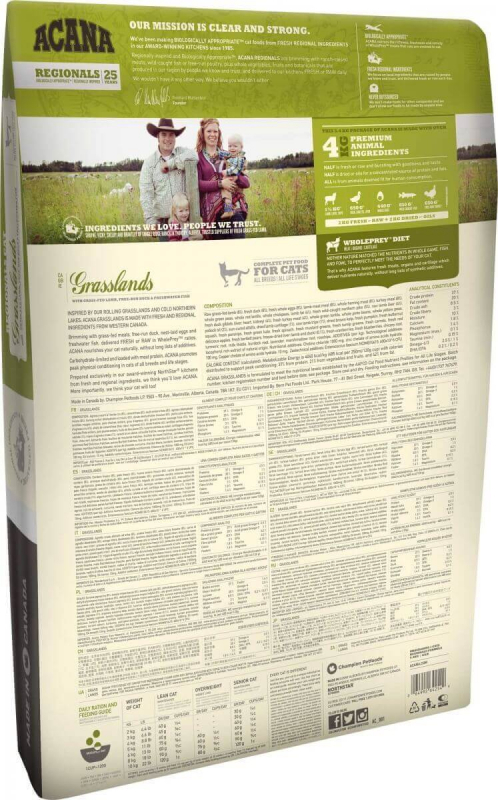 Rich in protein and low in carbohydrates to match your cat’s natural diet, ACANA Grasslands is free of high glycemic carbohydrate ingredients (such as rice and potatoes) found in conventional cat foods. Fresh boneless lamb (15%), dehydrated lamb (13%), fresh boneless duck (8%), dehydrated pollock (7%), duck fat (5%), green lentils, fresh yellow perch (5%), dehydrated herring (5%), red lentils, dehydrated salmon (4%), chickpeas, green peas, herring oil (3%), fresh whole eggs (3%), lamb fat (2%), sun-cured alfalfa, dried kelp, pumpkin, butternut squash, spinach greens, carrots, apples, pears, cranberries, chicory root, dandelion root, chamomile, peppermint leaf, ginger root, caraway seeds, turmeric, rose hips, freeze-dried lamb liver, freeze-dried duck liver, freeze-dried lamb.